After I cooked myself some matzoh ball soup, I used the leftovers in these parsnip latkes to add that crispness. With these oven “frying” you basically heat up the oil on a baking sheet for 10 minutes. This heated oil sizzles when you add the latke mixture and gives it that crisp, golden fried color. 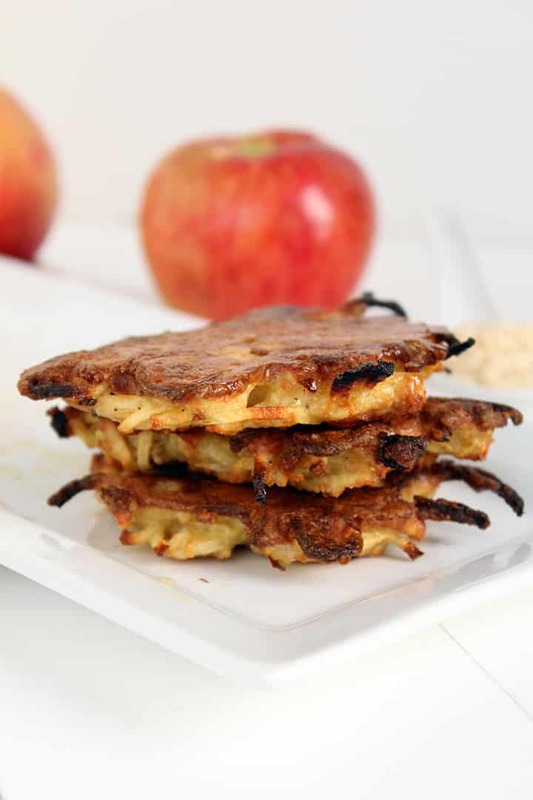 Just after 15-20 minutes, you’re almost done – one side of your latke is golden brown and all you need to do is flip, cook for 10 more minutes and then transfer to a paper towel lined sheet to let excess oil drip off. 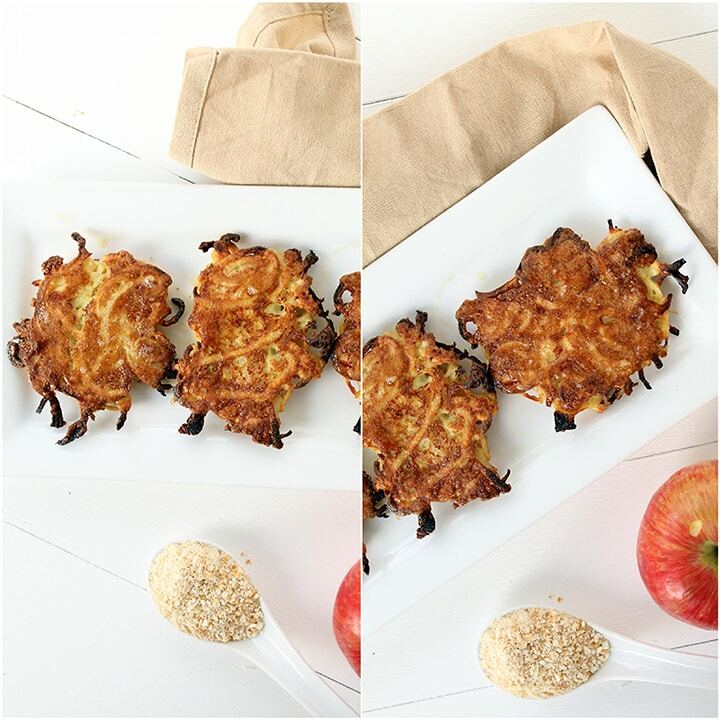 If you do cook these latkes on the skillet, I suggest using my “Inspiralized Bun” method, which you can find in this video. 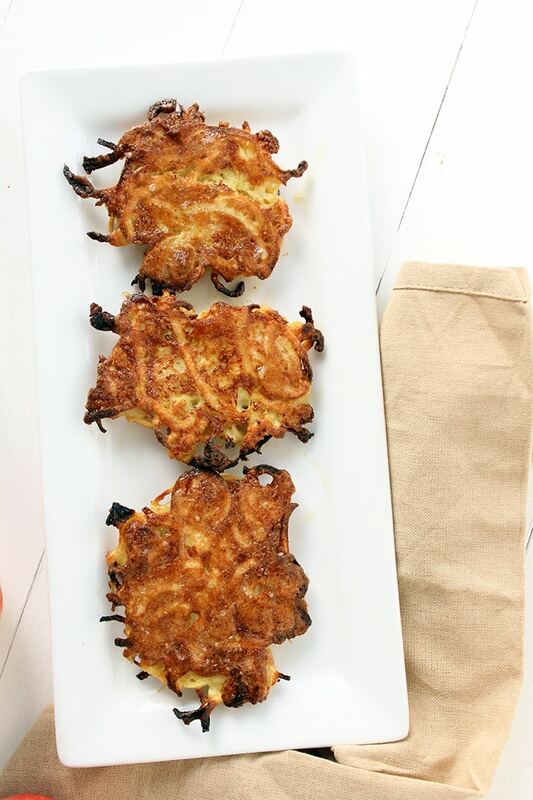 Otherwise, these oven “fried” parsnip latkes are perfect for your next Jewish holiday OR for those of you who aren’t Jewish, they’re perfect served alongside applesauce as a quick breakfast or paired with a protein, as a side dish. The parsnips are nutty and slightly sweet and as a root vegetable, are healthy and clean-eating friendly! Parsnips are high in dietary fiber, so they fill you up, nourish and satisfy the tastebuds. Also, don’t be afraid by the 1/4 cup of olive oil – not all of it gets used, I’d say about half of it gets used in the final oven-frying of the parsnips! 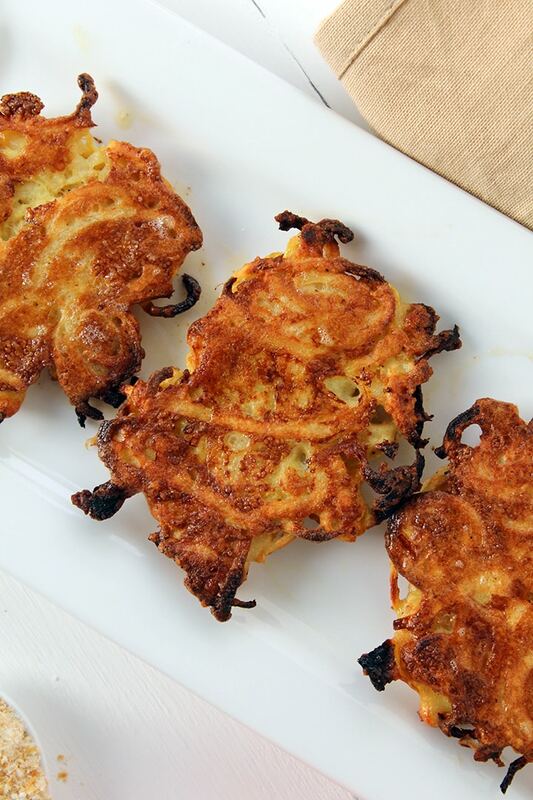 How would you pair these parsnip latkes? Preheat the oven to 425 degrees. Take out two heavy non-stick rimmed baking sheets. While the oven preheats, in a large mixing bowl, add in the eggs, matzoh meal, and season generously with salt and pepper. Mix together to combine and add in the parsnip and onion noodles. 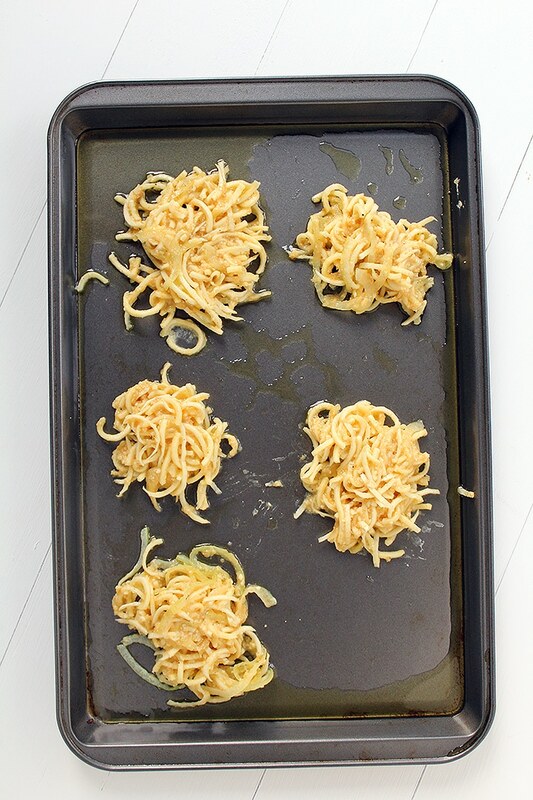 Pour the oil into the baking sheets and place in the oven for 5-7 minutes to heat the oil. Remove from the oven and place the parsnip mixture in handfuls onto the oil. Flatten and contain the mixture using a spatula. Bake for 15 minutes or until the bottoms are golden and crisp. 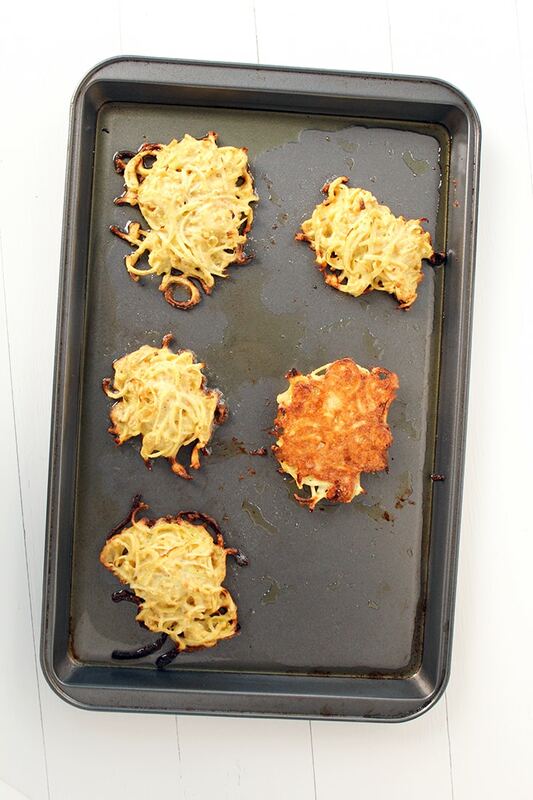 Remove from the oven, flip the latkes over and bake for another 10 minutes or until crisp and golden on both sides. When done, transfer the latkes to a paper towel lined sheet to drain. 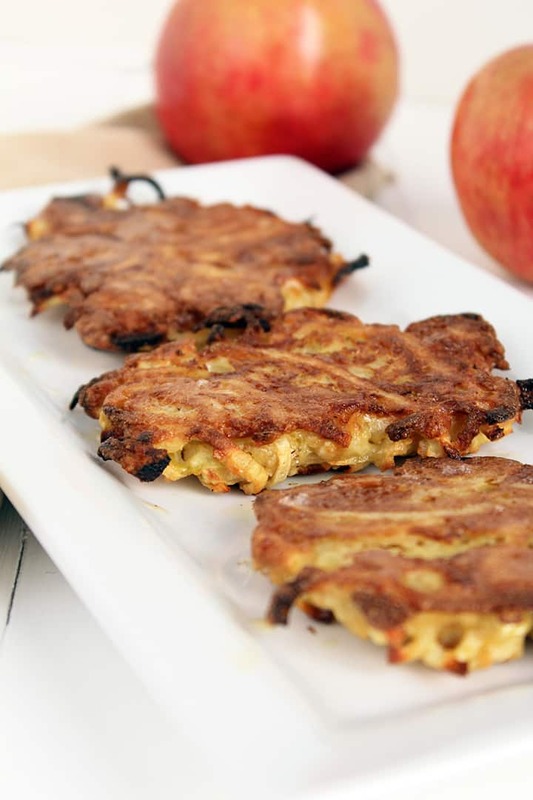 Serve immediately with apple sauce, if desired. Thank you for the oven frying technique. Oven frying. Genius. I also tend to burn things I fry on the stovetop. I find it difficult to control the temperature to my liking. Now I just need to find a substitute for matzoh (I live abroad, and sadly, it's not available here). I like to fry with coconut and avocado oil. They tend not to smoke, burn or give off a weird flavor like olive oil can do sometimes. These are in the vegan category but use eggs - what would you use as a vegan binder? Sorry about that, it was an error! I have sometimes used flax seed plus water as a binder instead of an egg. There are directions on the package that I buy. Can I substitute coconut flour in place of the matza meal? What does this do to the cookie sheet? I envision black stuff baked on that you'd have to scrape off. Does it clean easily? This is the greatest recipe ever - thank you! Thank you so much! This makes us so happy to hear!